The bimonthly LAFRANCE update was applied earlier in the week. 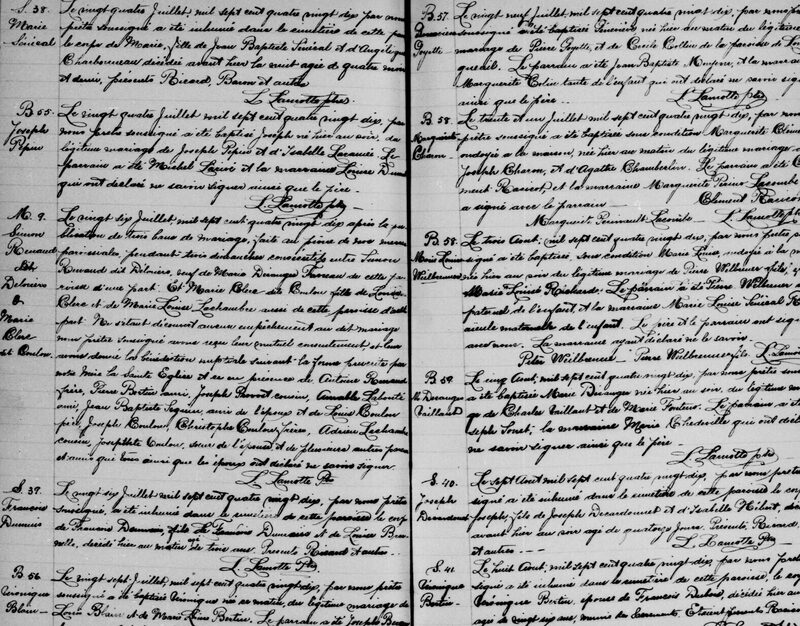 The LAFRANCE, one of 15 tools available to GenealogyQuebec.comsubscribers, is a detailed index with link to the original document of ALL Catholic marriages celebrated in Quebec between 1621 and 1916, ALL Catholic baptisms and burials celebrated in Quebec between 1621 and 1849 as well as ALL Protestant marriages celebrated in Quebec between 1760 and 1849. Baptisms and burials of the 1850-1861 period are added gradually through our bimonthly updates. We estimate to have completed about 70% of all Catholic Quebec parishes for this period. In addition to the 20 000 death notices added over the past 2 months, our obituary section is now equipped with subsections such as the province, city or publication in which the notice was published. All of these collections – and much more – are available with a subscription to GenealogyQuebec.com. From June 16 to June 18 2017, the Drouin Institute team will be at the Ontario Genealogical Society conference in Ottawa. All the details surrounding the conference can be found here. If you attend the conference, make sure not to miss Gail Dever’s presentation, “The Crème de la Crème of Online Resources for Quebec Research”, which will cover both GenealogyQuebec.com and the PRDH among other resources. Gail Dever is the author of the popular blog Genealogy à la Carte. Next PostNext Over 36 000 Records Added To The LAFRANCE!